If you want to learn the very best practise in book marketing from the indie author community and the trade, these podcasts are absolutely invaluable. If you'd like to add a podcast onto this list, then please add it in the comments. Information, inspiration and interviews on writing, self-publishing, book marketing and making a living with your writing. Joanna is the number one person to follow on all channels - her website has a huge amount of information too. Even if SFF isn't your genre, there is a lot to learn from this podcast. Hosts are Lindsay Buroker, Jeffrey Poole, and Joseph R Lallo and have self-published more than 30 novels between them. Backlist marketing, branding and much more. Practical ways to get better results with your author business with Stephen Campbell. Award-winning marketer Chris Syme's 20+ years in marketing and bestselling indie author Becca Syme make sense give tips on selling more books and building loyal fans. Weekly interviews with million-selling indie authors, breakout stars from traditional publishing, industry insiders and experts giving valuable insight into social media advertising techniques, and everything else in between. This is a brilliant podcast and Mark runs all kind of courses for authors too. 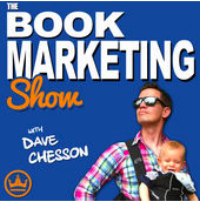 Dave Chesson created one of the largest websites on book marketing, Kindlepreneur.com, he’s also been a book-marketing consultant for top NYT Bestselling authors in both fiction and non-fiction as well as helping big name publishing companies increase their sales. Lots of very practical book marketing tips and tactics to sell more books. Help get your story out to more people and make the world a better place. We interview authors who are self-published, indie published, and traditionally published to find out what’s working right now to help you grow your career and sell more books. On The Publishing Profits Podcast show, international bestselling author and publisher Tom Corson-Knowles interviews the publishing industry's best authors, publishers, editors, literary agents, marketers, and attorneys to share inspiration, education and best practices. Author and screenwriter Mark Stay with coach, entrepreneur and recording artist Mark Desvaux interview million-selling, chart-topping authors, publishers on the inside, editors, agents and social media specialists. From the writing to marketing, plotting to publishing, learn the secrets to help you write your way to the top of the charts. This is the show for novelists who hate marketing, but still want to become bestselling authors. Our goal is to make book promotion fun and easy for writers who would really rather be writing. The Smart Author podcast guides writers step-by-step from the very basics of ebook publishing to more advanced topics, all with an eye toward helping authors make their books more discoverable, more desirable and more enjoyable to readers. Presented by Mark Coker, the founder of Smashwords. This podcast is for all writers of all experience levels. Discover the latest book marketing and publishing news, tools and strategies. This is the Sell More Books Show with Jim Kukral and Bryan Cohen. Every week you'll get helpful tips and ideas to make your book sales soar. Why authors should never design their own covers (Without help).